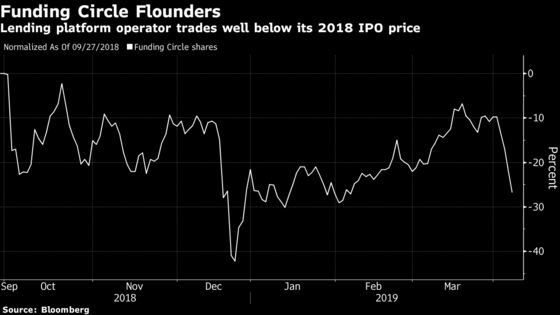 (Bloomberg) -- When Citigroup Inc. raised alarm bells last year over the finances of one of Funding Circle Holdings Plc’s key funds, shares in the lending platform operator plummeted. It turned out to be a good call. The company with adverts often seen on London’s underground rail network said Friday that Funding Circle SME Income Fund Ltd. may be wound down after a majority of shareholders indicated they’re no longer willing to provide credit. Funding Circle’s stock fell as much as 8.8 percent, leaving it languishing about 28 percent below its September initial public offering price. Yet Funding Circle is still managing to raise capital elsewhere: Earlier this week it closed a 187-million-pound ($245 million) asset-backed security deal that Chief Capital Officer Sachin Patel said further validates the attractiveness of potential returns for investors in loans to small- and medium-sized enterprises. “FCIF has been a declining part of Funding Circle’s overall funding mix and was expected to fund only about 3.5 percent of our origination volume in 2019, as we’ve continued to diversify and deepen other funding sources,” a company spokesman said by email.